The new SPECTRO XEPOS spectrometer represents a quantum leap in energy dispersive X-ray fluorescence technology. It provides breakthrough advances in multi-elemental analysis of major, minor, and trace element concentrations. New developments in excitation and detection deliver outstanding sensitivity and detection limits — yielding remarkable gains in precision and accuracy. The amazing SPECTRO XEPOS excels at critical tasks from rapid screening analysis to precise product quality control. Apply it for at-line processing in a variety of industries, for geology and mining, for environmental and waste monitoring, and for research and academia. Different versions maximize performance for selected elemental groups in specific matrices. An innovative X-ray tube and unique new adaptive excitation technology furnish the highest possible sensitivity, optimized to target elements of choice. Watch video demonstrations of the SPECTRO XEPOS – or click here to switch to SPECTRO on YouTube.com. The analysis processes that are recommended in many pharmacopoeias for the determination of impurities can require complex sample preparation. They sometimes do not show very good reproducibility and have to be matched to the sample matrix. Energy-dispersive XRF conforms to the analysis processes described without the requirement of extensive sample preparation. Using optimized excitation and evaluation parameters, the technology provides detection limits that are sufficient for the analysis of most of the relevant elements. The production of pharmaceutical products requires the analysis of a series of essential trace elements such as Fe, Cu, Zn, Se, Ca, Mg, Co, Si, and Mn as well as elements that are toxic in larger concentrations such as Cd, Pb, As, Hg, Cr, Mo, Ni, V, and Cu. In addition elements from the use of catalysts like Ir, Os, Pd, Pt, Rh, and Ru have to be monitored. Aspects such as the bio-availability, toxicity, and quantity of the elements must be considered. The sources of such impurities can be production-related contamination from sieving and grinding processes, treatment with catalysts, and transportation in piping. Additional impurities may result from packing material and preservatives. It is also possible that the raw material, e.g. from plants, is already contaminated. The lithium ion battery supply chain extends from mines and refiners to makers of cells and battery packs to original equipment manufacturers (OEMs). Determining exactly what elements are present in a given material, in exactly what amounts, can play a critical part in quality control at various processing phases. This paper outlines requirements for elemental analysis of processed materials at selected steps in the chain, focusing on graphite, lithium salts, and cathode components. It presents the latest advances in some traditional measurement solutions for these materials, such as ICP-OES analysis. However, the paper also highlights two proven analytical technologies not yet commonly used for lithium ion battery applications: ED-XRF and ETV-ICP-OES. These offer exciting new capabilities and advantages — such as speed, convenience, and precision — that recommend them for wider application in the battery industry. The analytical challenge: to set up one XRF method to cover all the above-mentioned applications — all the important elements of interest and all the required calibration ranges — and also to achieve the required limits of detection. Multi-elemental analysis of samples from geological and allied materials represents a critical task for spectrometric instruments. Users in science, industry, and business routinely use such spectrometric analysis on materials of widely varying composition. Energy-dispersive X-ray fluorescence (ED-XRF) instruments are often preferred for this work. This paper covers the use of one such instrument to analyze trace elements in samples of geological and allied materials, prepared as pressed powder pellets. Users in science, industry, and business routinely use spectrometric analysis on materials of diverging composition. The applications vary widely and in many cases the precise determination of major and minor element concentrations is critical. Typically wavelength-dispersive X-ray fluorescence (WD-XRF) instruments are used for these applications as they are known to provide the required precision. Energy-dispersive X-ray fluorescence (ED-XRF) instruments historically have been used for screening analysis. However, modern instruments have reached a level of precision comparable to that achievable with WD-XRF. This paper mainly covers as example the use of the SPECTRO XEPOS ED-XRF instrument to analyze major and minor elements in samples of geological and mineral materials, prepared as fused beads. Using polarization and direct excitation technologies, it proved a powerful analytical tool to satisfy the needs of high precision and accuracy. Blast furnace slags result during the production of pig iron in blast furnaces. According to the present state of the art, approx. 250 kg of blast-furnace slag results per ton of pig iron. Analysis as close to the production site as possible is used for both quality control of the process and also for evaluating the usability of the slag as a material for recycling. Traditionally, samples are milled after crushing and either prepared as pressed pellets or as Lithiumtetraborate fused beads and then analyzed with XRF. 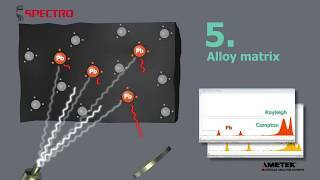 Wavelength-dispersive XRF spectrometers have predominantly been used for this application. Today, this analysis can also be performed, close to the production site, with the compact, energy-dispersive X-ray fluorescence spectrometer SPECTRO XEPOS. Using a combination of polarized with direct excitation with state-of-the art detector technology, high precision can be achieved with short measurement times (180 s per sample). This paper covers the use of one such instrument to analyze typical elements of interest when analyzing blast furnace slag. Analysis of elements deposited from airborne aerosols onto air filters comprises an important use of spectrometric instruments. In addition to other components of deposited aerosols, users focus particular attention on heavy metals. The identity and concentration levels of such metals are of obvious concern for a variety of ecological and toxicological reasons. Precise information can also frequently help trace them back to their sources. 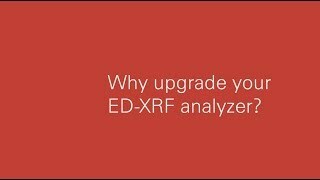 Energy-dispersive X-ray fluorescence (ED-XRF) analyzers are often utilized for this work. Their stability and ease of use provide major advantages. These days, renewable fuels and other biofuels play a growing role in the offer of automotive fuels. Currently, fatty acid methyl ester FAME, mostly derived from vegetable oil, is typically blended with regular diesel fuel in the 5-10 or 20% range. An alternative for the fairly expensive fresh vegetable oil is recycled vegetable oil derived from the food industry. An elemental analysis of the pure FAME, the used vegetable oil, the reprocessed vegetable oil; as well as of the biofuel blends is required to show compliance with actual specifications. Typically, this type of analysis is done using ICP-OES following the test methods EN14538-2006: describes the analysis of Ca, K, Mg and Na in FAME, samples require a 1:1 dilution (50%) in kerosene (to reduce matrix effects) and no internal standard is used. EN16294-2012: describes the analysis of P in FAME, samples require a 1:3 dilution (25%) in kerosene and the use of an internal standard is mandatory. Sulfur is not part of these methods and is determined using different technologies. The analysis requires some sample preparation and in-vestment in purchase and operating cost of the analyser. This report describes a quick and economic alternative to quantify the sulfur content in FAME using ED-XRF. X-ray Fluorescence is an accepted technique for analyzing cement and other materials in the cement making process. The performance requirements for analyzing hydraulic cement are described in the standard method for (wet) chemical analysis ASTM C-114. This report describes the qualification of the SPECTRO XEPOS for the simultaneous analysis of the 13 oxides CaO, SiO2, Al2O3, Fe2O3, SO3, MgO, Na2O, K2O, P2O5, TiO2, Mn2O3, ZnO, SrO and Cl in Portland cement according to ASTM C-114. The analysis of cadmium and other elements of concern for the environment in a wide range of materials is described extensively in the EU’s RoHS (Restriction on Hazardous Substances) directive. Together with the WEEE (Waste Electric and Electronic Equipment) guideline, these form the basis for measures, which must be implemented by the electrical and electronics industry. This application report shows that the SPECTRO XEPOS has excellent qualifications for performing the necessary analyses with reference to the examination of Cd, Pb, Hg, Cr, and Br content in various raw materials or also finished components. In cosmetics manufacturing, quality control laboratories are responsible for ensuring that the necessary and relevant controls are carried out for sampling and testing per ISO 22716; ensuring that only materials and products that conform with the required acceptance criteria are released for shipment and use. The quality control laboratory is expected to use the available and defined test methods necessary to confirm that the product complies with all quality controls and health and safety regulations. Effective quality control includes elemental analysis to be certain that additives or active reagents are included in the final product in accordance with specifications. This type of analysis is not only possible in a main quality control lab, but can also support production directly at-line to avoid manufacturing offspecification products. The analysis of cadmium is very important because the EU has amended the maximum concentration levels in COMMISSION REGULATION (EU) No 488/2014 of 12 May 2014 amending Regulation (EC) No 1881/2006 as regards maximum levels of cadmium in foodstuffs. In combination with a simple sample preparation technique the SPECTRO XEPOS offers excellent analytical performance for the analysis of low levels of Cd in cocoa. Government regulations designed to maintain food quality have been implemented around the world. Numerous standards regulate the composition and quality of foods and the methods recommended to determine compliance. Food manufacturers and regulating authorities alike require relatively simple and inexpensive methods to perform accurate, reliable results. This report describes the performance of a calibration that offers the required accuracy to determine the key elements for micronutrients in milk powder. The optimized excitation conditions using a band pass filter and polarizer allow for high sensitivity and form the basis for a good precision and accuracy. The SPECTRO XEPOS can determine critical trace elements at very low detection levels. Residues of heavy metals in cosmetics can be dangerous because of their toxicity. Possible sources of metals in cosmetics can be contamination of basic ingredients, of color additives, and processing. Therefore, it is also important to monitor the ingredients for cosmetic products for critical trace elements. For some heavy metals, internal, for others external, maximum concentration limits are set. Typical elements of concern include arsenic, cadmium, chromium, cobalt, lead, mercury, and nickel. The vast majority of pharmaceutical firms rely on automated document management systems for manufacturing operations. These systems are proven to reduce operating costs and shorten time to validation. In the U.S. (and in other countries where drugmakers and healthcare firms export to the U.S. market), these systems are also built to comply with Food and Drug Administration (FDA) regulation 21 CFR Part 11. Originating in 1997, this first enabled use of electronic signatures and electronic records in documenting batch processes within pharmaceutical manufacturing. As defined by the regulation, an electronic batch system integrates batch management, batch control, and batch information. In this context, batch management includes equipment history, process modeling, materials tracking, recipe management, batch history, scheduling, security, reporting, process logging, execution, and displays. Similarly, batch control includes multivariable predictive control, expert monitoring, phase logic, and exception logic. And batch information covers data analysis and enterprise resource planning (ERP) system integration. This paper highlights some relevant features of XRF Analyzer Pro (XAP) software from SPECTRO Analytical Instruments. This software is installed in X-ray fluorescence (XRF) spectrometry instruments including SPECTRO XEPOS and SPECTRO MIDEX. It can help users in the pharmaceutical industry comply with regulations and deliver full system benefits. Click here to request this paper. Click on the link below to further explore the SPECTRO XEPOS.